Where lakes and still rivers bask under towering peaks, opportunities for reflection shots about. 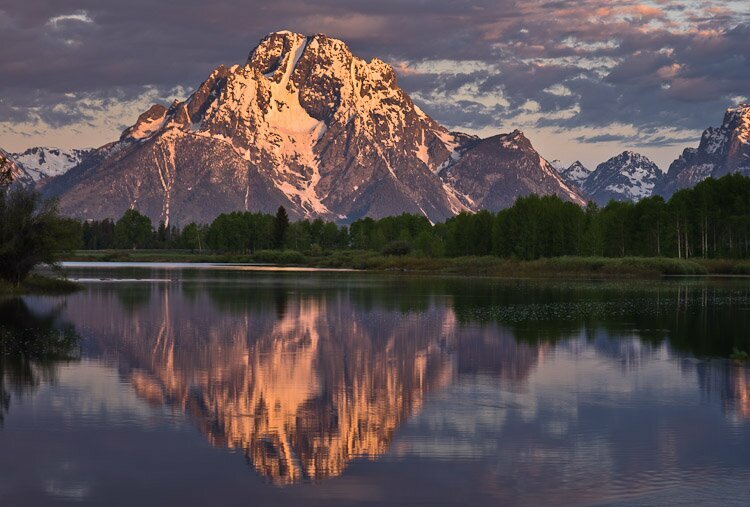 Grand Teton National Park is one of the premier spots for getting reflections shots: that is, shots of mountains reflected in blue-tinged water. The combination of many small bodies of water in wind-sheltered alcoves flanked by eastward facing mountains is what makes Grand Tetons so fecund for reflection photography. With eastward mountains, you get your reflections in the morning, when winds are lightest. Smaller bodies of water resist rippling due to breezes. With placid, smooth sheens of water you can find spots to photograph the Tetons reflecting in lakes and rivers to your heart’s content. 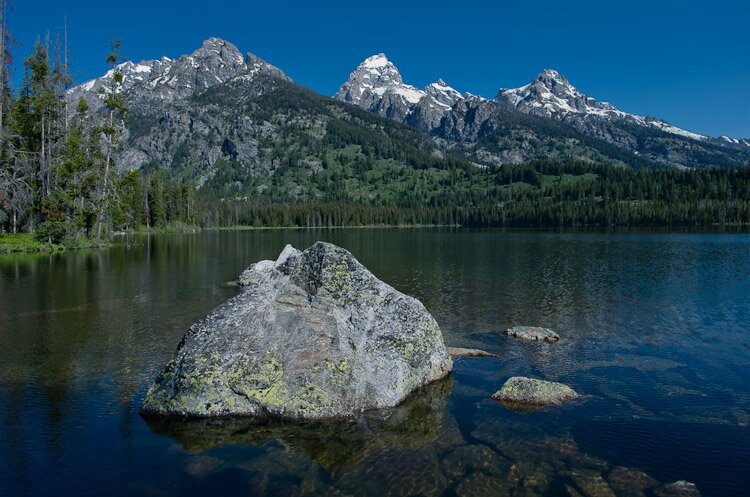 These photos are taken along String Lake, which is closer to the Grand Tetons than Schwabacher Landing or Oxbow Bend. They were taken between nine and ten in the morning, which is interesting because there are many landscape photographers who won’t shot even a half hour after sunrise. They don’t know what they are missing. If you have a mixture of clouds and sun the light will remain pretty good well into mid-morning. Not as soft and warm as the “magic hour” around sunrise and sunset; but perfectly fine in it’s own right. It’s bluer and with more contrast, which can help bring out the blues and greens of mountain scenery. It will only get worse from this point on, until the breezes of the afternoon turn the water into a choppy mess.